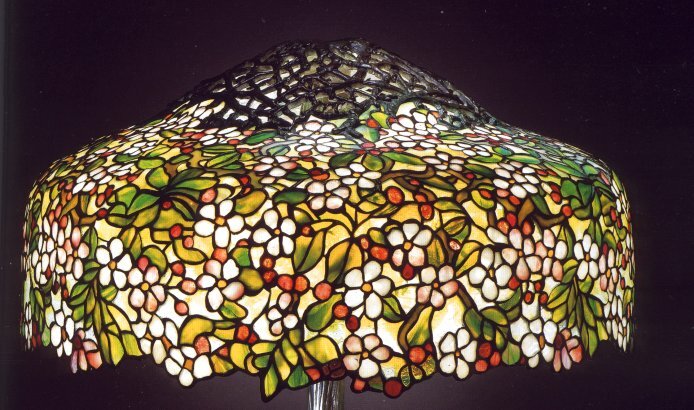 This lamp appeared in Christie's March 1999 auction. 28 3/4" high, 25 1/4" diameter of the shade, the shade tag stamped TIFFANY STUDIOS NEW YORK, the rounded underside of the fitter in the shade stamped 7809, the tree trunk base stamped TIFFANY STUDIOS NEW YORK 7809 and the outer rim of the base stamped 7809. Mr and Mrs William Feldstein Jr.
© 1999, Christie's New York, all rights reserved.